Lambertville’s issue with vultures was a major topic at the Governing Body of the City Meeting on Jan. 29 at the Phillip L. Pittore Justice Center on South Union Street. The item was up for discussion on the evening’s agenda, but during the public comment period, a Lambertville resident on Coryell Street did not complain about the vultures at all, but expressed her concern over what is seen as a negative attitude toward them. “I love vultures. They hang out at the (Mercer County) Wildlife Center … they’re non-invasive animals and I’m afraid of what is going to be done to alleviate them,” she remarked. Mayor Julia Fahl responded that she has received concerns of vultures eating some of the sealant in and around the Pittore Center’s chimney and roof, in addition to resident complaints of vultures roosting in backyards. 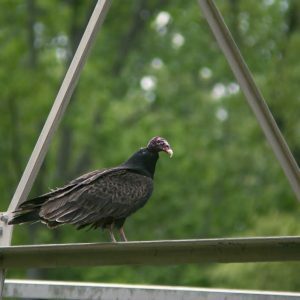 Fahl noted she had to do some research on the subject and clarified that black vultures and turkey vultures are protected by the state of New Jersey (and also by the federal government under the Migratory Bird Treaty Act of 1918). The mayor said she learned of three ways you can discourage vultures from roosting in a particular area (although it is apparently difficult in the winter time). Two are not particularly advisable because they involve auditory noise, or the cost of hiring a federal worker to hang fake or real vulture effigies near roosting areas. The most appealing solution is light or “visual noise,” which could be produced from mylar tape or balloons for example. The issue seems to exist mostly on the south side of town, but complaints have also been received from Heritage Village on Cottage Hill, the First Presbyterian Church of Lambertville, as well as from residents of Kline’s Court, Ferry Street and South Union Street. The state vulture expert who Fahl spoke with suggested forming a committee to map the hot spots, something the mayor indicated might be entrusted to the newly created volunteer committee and will be discussed at the Feb. 4 working session. Councilman Wardell Sanders asked if council knew what was attracting the creatures. Fahl noted that a dumpster was left for too long and that people started throwing food in it. “I had them all summer in the tree in my backyard, and they were attracted there because there’s a feral cat colony and people were feeding the cats outside,” Councilwoman Elaine Warner said. Fahl said that she had asked the expert about the cat colony, who observed that the animals were highly unlikely to have attracted the vultures, but that “potentially the wet cat food would maintain a vulture presence.” The mayor said she asked those feeding the felines to switch to dry foods. City Clerk Cindy Ege said the the Justice Center had a serious water leak caused by the birds. “In the meantime it might be worthwhile to get $40 worth of mylar balloons and attach them to the roof to make sure we don’t continue to see more damage to the municipal building,” Fahl suggested. 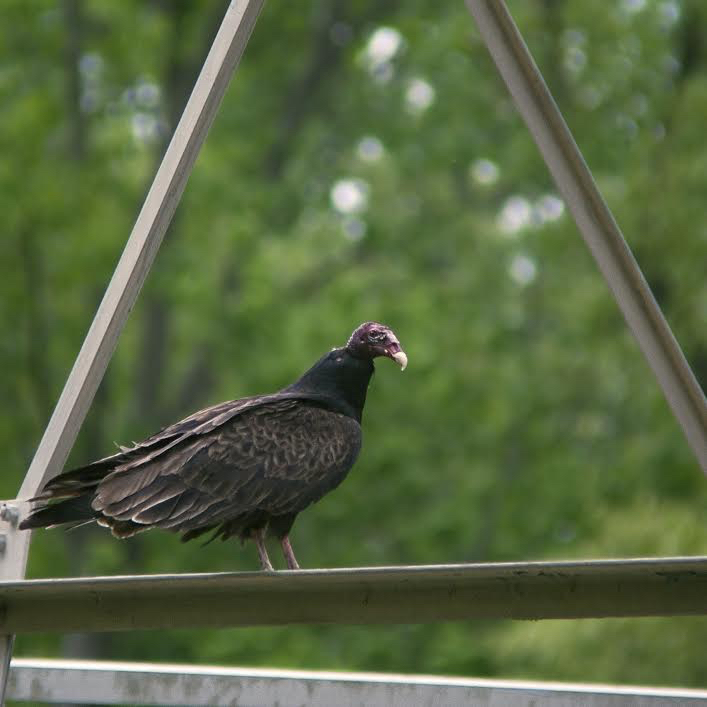 According to the Cornell University Lab of Ornithology, the Lambertville-New Hope area is a fringe area for black vultures, but warming temperatures, increased deer roadkill, or changing attitudes about them, might be broadening their range north. The range of turkey vultures is more common to eastern Pennsylvania and all of New Jersey. Hanging the CD’s works. I used it to keep woodpeckers away from my cedar siding. If the garbage especially food waste was contained properly,ie: closed containers. The attraction would cease. This action,of course,would effect other wildlife. And to keep biohazard,illnesses in check. Obviously some people are disturbed by the presence of vultures, so the City Council responded to their complaints, and that’s a good thing. And the Mayor and the rest of us may have learned a little more about vultures. But vultures are harmless and unaggressive, and there’s no need for any action on the City’s part. Take the advice of some other posters and use mylar balloons or old CDs to discourage them. Better still, don’t feed “cute” wild animals (like feral cats or deer) and then complain when the food also attracts animals you find less desirable, like vultures. They all compete for the same food, often with domestic animals, and they all defecate somewhere too. I love the vultures. They have been coming here for all of the twenty-two years that I have lived in Lambertville and I’m sure they were here long before there was a Lambertville. Let’s not be like those people who buy a house near the airport because the price is right and then complain about the noise. It sounds like our area needs to cull some deer. Glad that others see the “beauty” and value of the black vultures! I happen to love them, and I’m fascinated by them – their roosting habits, social interactions, etc. They are federally protected because they are nature’s recyclers. They handle road kill so the road crews don’t have to. Yes their droppings are messy, and yes they can chew on items that cause damage – but one way to deal with them is to discourage them from landing in those areas. Some of the ideas listed above are good. Do not harm them, or you can be fined. Also – bring in any dishes that have leftover wet cat food, or put the food under cover where the vultures can’t access it. Don’t feed the vultures. Once one comes, you’ll have dozens more. Close the dumpsters near restaurants and other public places. They are awkward but harmless creatures when they hop around and land, but enjoy the beauty of them when you watch them soar in the sky. They are one of the most graceful birds in the air ! There are four feral cats in a Ferry Street back yard. They are being feed by caring folks, especially Joe and Lori. The vultures show up everyday around 7 am and leave around 5 pm. If wet cat food is left out the birds chase the cats and devour the food. They will eat dry cat food when they are starving. They are dirty birds when hanging out on the ground. They are magnificent flyers. They are graceful floaters. Still, the area they’ve decided to roost, would be better off if they leave. VUltures are not pretty but they’ve been around longer than those complaining. They roost near to where there is ROAD KILL and they clean that up– perfectly. They’ve been nested in the nooks of the quarry near the workhouse as long as I can remember. We have them on the PA side of the river as well. They don’t stay long in any single place . They stay only until the dead critters are consumed. Very tiday. Requires fewer road crews to remove road kill.